We specialize in Termite Solutions and Bed Bug Control. Our philosophy is Honesty Above Reproach, which means that with our company you will always receive an honest answer to any questions you have. We offer big company service at an affordable small time price. Termites are among the most costly pest to control once they make a building their breeding ground. Each year, the amount of damage caused by termites and other wood destroying pests amounts to billions of dollars. This cost can be easily and greatly reduced with regular termite inspections and treatments. Together we can protect your investment from wood destroying pests so you can focus on the more important things in life. Do you have unwelcome guests taking up residence in your home and need to kick them out? 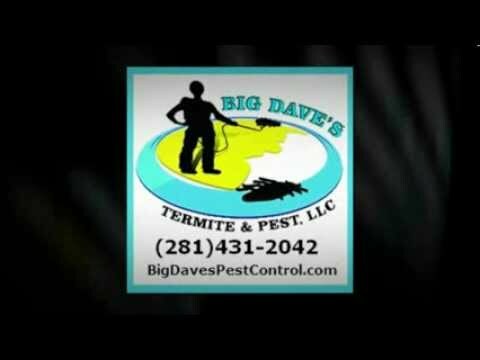 Call Big Dave's Termite and Pest control! We will clear them out and make sure they don't come back! We specialize in Termites, Bed Bugs, Ants, Spiders and other pests. Big Dave's Pest Control we understand that pests need to be taken care of promptly. We have a vested interest in providing an environmentally conscious, cost-effective solution for your pest problems. We will provide treatments to best meet your specific needs. Our services are available for Galveston County Texas including Galveston, Missouri City, Sugarland, Fresno and surrounding areas. Effective pest control is a complex process that requires a great deal of knowledge and training. Why try to do it yourself when we can do it for youwith GUARANTEED results.